As I sit here reflecting on the past three months that was our time in Borneo, I feel like I was sucked up into a raging hurricane that took me to another world and I have only just landed back on planet earth. It is now with hindsight, in the calm after the storm, that I can think about just how enormous and completely insane our journey and time in the jungle really was. Without doubt it was the most intense, impossibly difficult and emotionally draining experience, but yet also totally inspiring, exhilarating and amazing beyond all belief. Borneo is an island of extremes. The exquisite beauty of the natural environment is matched by the warmth of its people. 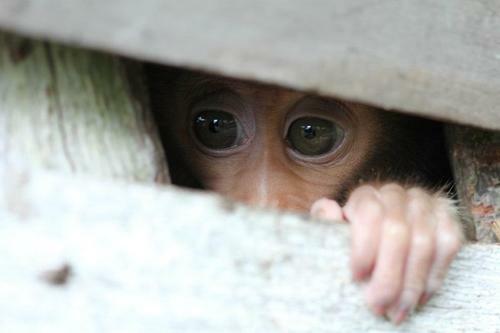 The devastation caused by deforestation, hauntingly sad, like the look in an orphaned orangutans eyes. We wanted to achieve so much. In the end we didn’t achieve even half of what we had hoped to, but I am still proud of what we did complete. The fact that we encountered so many obstacles taught us lessons we simply could not have learnt any other way. I am more determined than ever to continue this important work and I have certainly not lost hope for a better future. 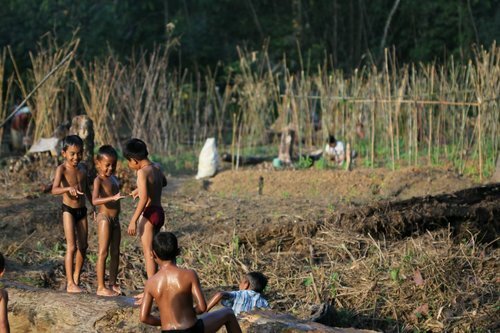 There is simply no other way to describe the village of Tembak other than as an oasis. In order to get to Tembak you must travel for about four hours through the expansive biological desert that is palm oil, with plantations as far as the eye can see surrounding you in every direction. On arriving at Tembak there was a deep feeling of warmth and acceptance as the local people smiled and waved and the children ran on to the road to greet us with pure excitement. You are immediately struck by the drop in temperature, a result of the lush rainforest that surrounds the village. The air is fresh and clean. The village of Tembak is truly an untouched oasis in the middle of a desert of destruction and is the place we called home for most of our time in Borneo. Tembak is a sustainable model for villages throughout Indonesia. Its people are the living proof that it is possible to live an enriched and happy life, totally at one with nature, without giving in to the short term financial enticements of the palm oil industry. The village is powered by a number of micro hydro systems which supply 100% green energy as well as fresh drinking water. The people cultivate their own fish in an aquaculture system to minimize the pressures on the local streams and rivers from over-fishing. Most of the building materials, food plants and medicines are sourced from the rainforest and the women of the village have started a community vegetable garden to grow fresh produce. One of my favourite memories of Tembak was listening to the early morning sounds of the village as I woke up each day. At around 5:45am as the sun was rising the sounds of children talking and laughing could be heard as they prepared for school. The pigs across the road from the home where we were staying would start squealing for their breakfast, whilst the roosters crowed and the dogs barked. The sounds of the men hammering and cutting and the motorbikes whizzing by could also be heard. The minute the sun rose the whole village literally just burst into life and this was all before 6:00am! It was a privilege and an honour to be welcomed into the community and to have the opportunity to work alongside the local people. We spent a number of days helping the village men to build a dam to divert water into one of their newly constructed micro hydro systems. We spent hours in the river lifting up huge boulders and transporting them on floating barges of timber. The strength of the men was incredible! They would lift huge boulders from the bottom of the river, some weighing 30kg or more, whilst trying not to be washed away by the extremely powerful current. There were a number of times when a hand or leg was almost lost when the boulders rolled off the timber and went crashing into the water where we were standing. The teamwork and sense of purpose made this physically challenging and important work so rewarding. 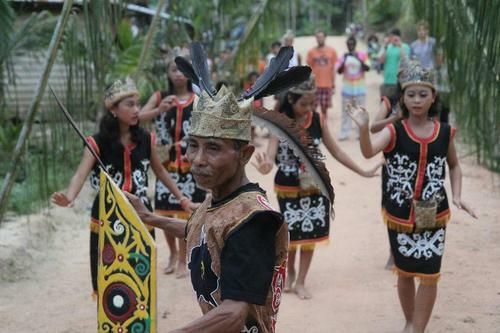 The biodiversity and abundance of wildlife in the forests surrounding the village is testament to the amazing job the people of Tembak are doing to preserve their forest. We spent many nights out in the jungle surrounding the village looking for wildlife. On one particular occasion we had a very interesting encounter with one of the many amazing creatures that call the forest home. A small group of us accompanied by a man named Ali, our local wildlife expert, had been walking for about an hour when we came across a small clearing in the forest. We decided to turn off our headlamps and just listen to the sounds of the night. Suddenly, about 40 metres away at the edge of the clearing we heard a loud, high pitched barking/yelping sound – one of the strangest animal calls I had ever heard. Ali paused, turned to me and said “go, go, go!”. Having no idea what kind of animal had made the sound, or why we were running through the forest away from it, really got my adrenaline pumping. After we were well away from the clearing Ali explained to us that the sound had been a warning call from a sun bear which had wandered into the clearing downwind from us and had picked up our scent. Ali went on to explain that sun bears are extremely territorial and will not hesitate to chase down intruders. I was extremely thankful that Ali had been with us as I probably would have walked towards the sound to find out what it was! The people of Tembak taught me so much about how to live and about what is important. They opened their homes and their hearts to us in ways we could never repay. Leaving Tembak was highly emotional, but I was comforted by the thought that I would certainly return here many times in the future. One of the village elders told me that he felt like we were family and that we would always have a home in Tembak. After living side by side with these people and seeing their commitment and dedication to preserving their forests, I know they will continue to fight for the future of their children. At the end of the first trip to Borneo in September 2011, the Eco Warriors were divided into four teams based on our skills, knowledge and past experience. There was the reforestation team who worked in Tembak to establish a number of native plant and community nurseries. The mapping team who used satellite technology and small drones with cameras attached to map the surrounding forest areas of Tembak as well as assist another local village to protect their forest from a palm oil company. The education team who travelled throughout the Sintang district performing a theatre based educational show for thousands of students about the importance of protecting the forest. The final team was the wildlife rescue and rehabilitation team of which I was a part of. 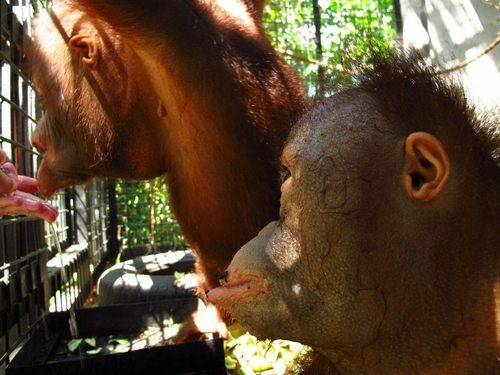 The wildlife teams’ primary goal was to help existing local organisations to plan and begin development of a new orangutan rehabilitation site in the village of Tembak. We were given a document with 540 signatures from the villagers of Tembak pledging 63 hectares of virgin rainforest which is to be used as a training school for orangutans undergoing rehabilitation. About one hour’s drive away is a further 20 000 hectares of pristine forest that could potentially be used as a release site, however more work is needed to ensure that this forest is completely secure for the long term. Our priority was to get JoJo and Juvi the three year old orphaned female orangutans in the Sintang Orangutan Centre, out to Tembak to begin the next phase of their rehabilitation as soon as possible. Working with the people of Tembak we identified the most suitable site for the construction of a basic enclosure which could be used as a ‘sleeping cage’ for JoJo and Juvi. The girls would spend their days in the jungle in ‘forest school’ learning the vital skills they will need for life in the wild, under 24 hour supervision by qualified and experienced carers and then come back to the cage of a night. Rather than building an enclosure from scratch we decided to transport an existing metal enclosure from the centre in Sintang out to Tembak. 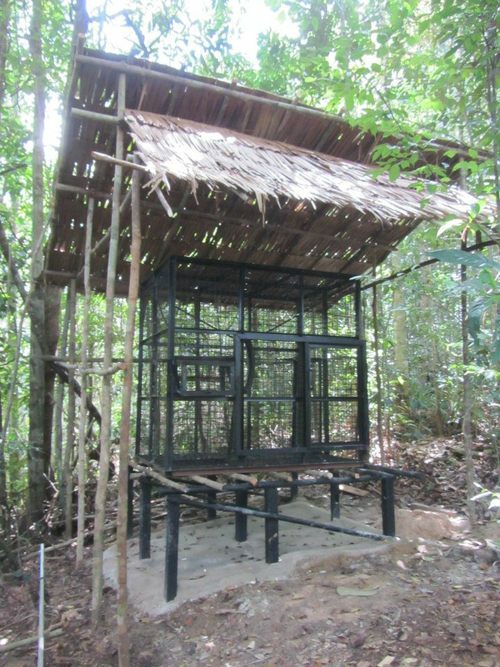 Working with the local men we constructed a raised timber platform that the enclosure would sit on to ensure optimum hygiene and minimize the risk of infection. A concrete slab was poured beneath the enclosure to allow the carers to disinfect and clean it out on a daily basis and a shelter was built over the top. 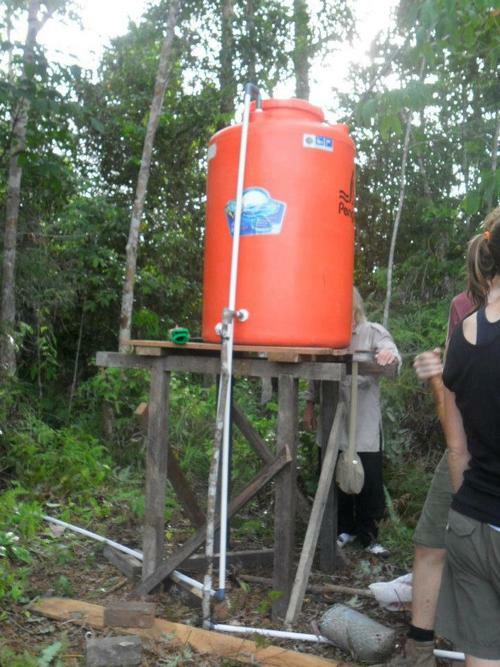 Since the site of the sleeping cage was 200 metres up a hill in the forest, we needed to get running water to the new enclosure. We purchased a small portable petrol operated pump, a 650 litre water tank and 200 metres of piping in Sintang. The local man who had been involved in the construction of the micro hydro systems for Tembak rigged up the pump and within one day we had fresh running water at the enclosure to use for drinking and cleaning! A technicians hut was also constructed to give the carers a place to sleep whilst they were on duty caring for the orangutans. 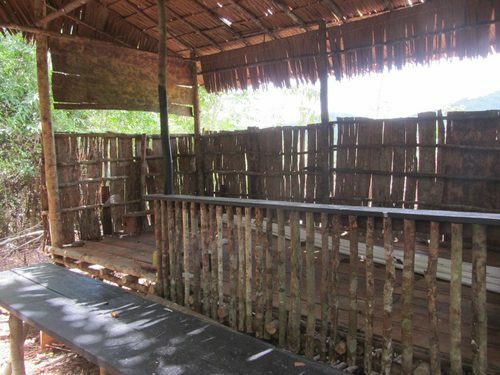 The hut was built about 30 metres away from the sleeping cage and out of sight, to ensure the baby orangutans did not get accustomed to having humans sleeping nearby. It was an amazing experience to work alongside the people of Tembak and see them professionally and efficiently, build these structures. Even some of the children got involved and it was so great to see the local knowledge being passed down through the generations. 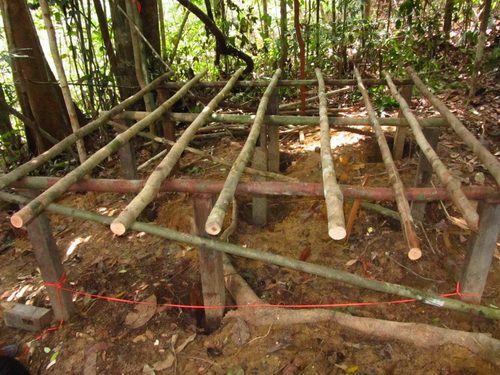 The very simple and basic structures built in Tembak are only the foundations and ground work for much bigger things to come. The next step before JoJo and Juvi can begin forest school and move to Tembak is the construction of an orangutan clinic. The money for this clinic has been secured through extremely generous donations and building is due to begin very soon. One of the local people we worked with on the planning of the rehabilitation site said something that really stuck with me. What he said confirmed how vital it is that we protect as much remaining forest as we can and get rescued orangutans out into the wild as soon as possible. 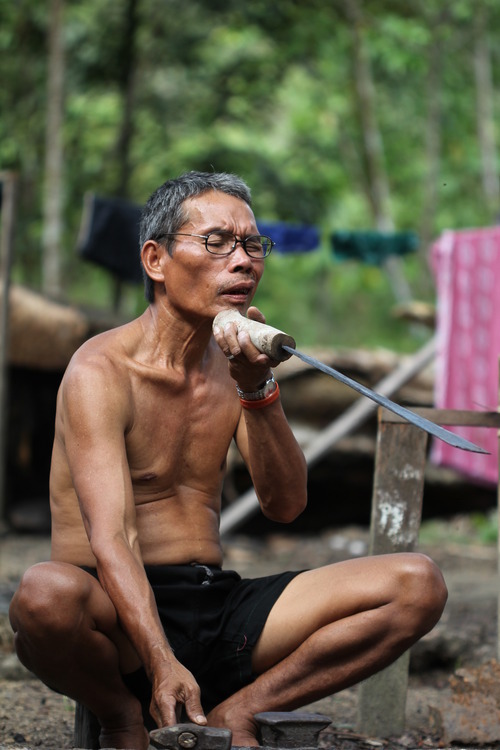 This man said that the local people are no longer using the name ‘orangutan’, meaning ‘person of the forest’. Instead they are using the term ‘orang kandang’, meaning ‘people of the cage’. They say that while a number of orangutans are being rescued, there is just not enough secure forest left for them to be released into and they end up living in cages inside rescue centres. The forests of Tembak and the neighbouring 20 000 hectares of virgin rainforest so close by, have the potential to offer something very special. This region could potentially be one of the few protected release sites for orangutans left in West Borneo offering a chance for these magnificent creatures to regain their name as the ‘people of the forest’. Another crucial aspect of the work of the wildlife team was to offer an education and outreach program to the local people to ensure they understood the importance of protecting their forests and of not keeping wildlife, such as orangutans, as pets. 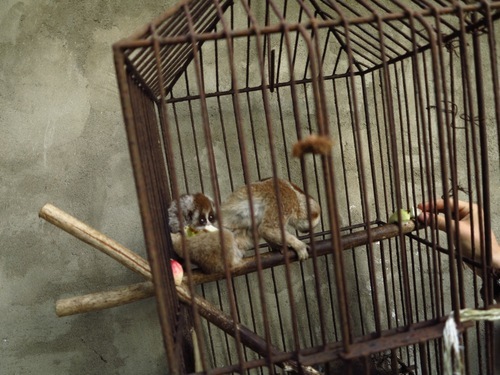 We visited many homes where people were keeping wildlife such as macaques, gibbons, birds, and even the endangered slow loris illegally as pets. After talking with the people and explaining that these animals may die if they continued to be kept in these conditions, most were happy to surrender the animal to a rescue centre or even to release them if practical. One family we spoke to had caught a mother slow loris (a small nocturnal species of primate) with a baby and were keeping them in a very small, dirty, rusty cage out the back of their house. They were excited at the idea of releasing the mother and baby and the families’ eight year old girl carried the cage into the forest and released them with her father. The people keeping these animals often have a genuine love and interest in them, they simply do not understand that by keeping them as pets they are actually harming them. Towards the end of our time in Borneo the team decided to take a week long expedition to Danau Sentarum National Park, one of the last untouched parts of West Borneo. The purpose of the trip was to reconnect with nature and see the true beauty of what we are fighting to protect. 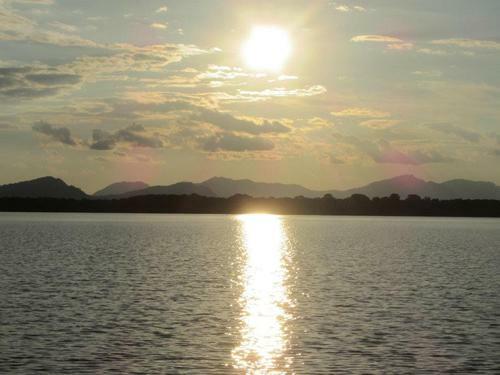 The national park is made up of a vast network of lakes and rivers which in the wet season provide much of the island of Borneo with fresh water. We were accompanied into the park by some of the local firefighters who patrol the park year round and in the dry season are responsible for ensuring the safety of this natural paradise. The national park has 265 species of freshwater fish, 310 species of birds, 31 species of reptiles and these are just the ones that have been identified, with many more undocumented species! In the last twenty years there have even been possible sightings in the park of a thought to be extinct endemic species of crocodile. We spent a night in one of the remote longhouse communities of people that call the national park home. During the day the locals took us out into the forest in search of wild orangutans. In the space of about an hour, we counted at least five orangutan nests that were only about a week old. Another highlight of the national park trip was an encounter we had with my favourite species of snake – the world’s longest species, the reticulated python. The four metre long female came right up to the back door of the ranger’s station where we were staying. As a result of the locals witnessing our genuine love and interest for this beautiful creature, it was inspiring to hear them say they would no longer kill these snakes when they encountered them. With so much to do time passed far too quickly and before we knew it, it was time to leave Borneo and head back to our home countries all over the world. It was extremely difficult to leave knowing that there was so much more work still to be done, but it was reassuring to know that the local people would continue this work as their own with or without us there. On one of our final days in Borneo, in the city of Pontianak on the west coast of the island we set up a small exhibition of photos from the project. Hundreds of university students attended the exhibition and were inspired to find their own ways of protecting their forests and wildlife. We left Borneo and spent a final three days in Singapore on our way home. We all experienced a huge culture shock going from the jungle to a huge modern city, the polar opposite to our experiences of the past three months. 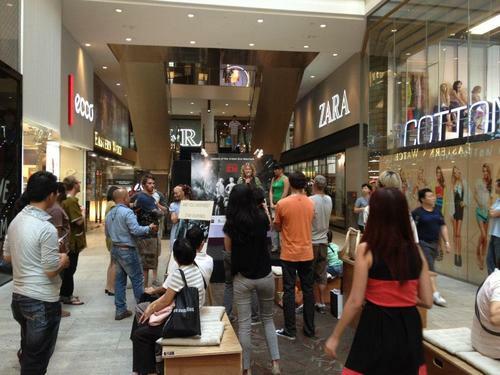 We spent a day in one of the largest and most sustainable shopping malls in Singapore talking to people about being ‘conscious consumers’ and encouraging them to stop and think about what impacts the purchases they make are having on the people, forests and wildlife in other parts of the world. Later that night a fundraising and awareness dinner was held with 40 seeds being planted in Borneo for every ticket sold. The 100 days spent working in the jungles of Borneo is a journey I will carry with me for the rest of my life. It was both the most challenging and most incredible thing I have ever been a part of. The people of Borneo fighting to save their forests and the future for their children and grandchildren are inspiring brave warriors. This is a battle the rest of the world must support them to win. Cutting down the forests to grow palm oil to fatten the waistlines of the wealthy and the pockets of a few is just wrong Whilst the 100 days are now over, the most exciting part about this project is that this is really only the beginning of something bigger. It is the beginning of a new movement of young people from around the world rising up to make a positive difference for this planet.